100% Pure Mascara lengthens and separates, coating each lash with healthy conditioners and coloring them with cocoa pigments. Water, smudge and flake resistant. I love this mascara! It smells phenomenal and it does s great job of separating my lashes. 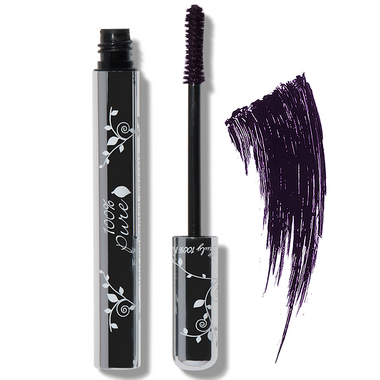 Don't expect it to be a vibrant purple, it shows up as a very subtle soft black on my brown-blonde eye lashes, but that's what makes it a great every day mascara. I also have the cocoa coloured mascara so I'm a huge fan of the 100% pure fruit pigmented mascara. I tried this mascara as it was reviewed highly on a blog that I follow. I am really unhappy with it. It runs really easily, just with watering eyes. It is really goopy too. I am not even going to finish the tube and will go back to Ananada. The 100% Pure mascara does lengthen the lashes when quite a few coats are applied. It holds well throughout the day, however it does not add body to the lashes, so I have to use another mascara for some thickness. I like the colour which is not totally black and absolutely love the smell of blackberry and a very decent brush (which is rare). Very surprised by this mascara. It is a little dryer than what I am used to using but has great lengthening with the most amazing smell ever - all natural from blackberries. Purple colour not really visible on lashes. Appears as black on dark lashes. Will most definitely buy again! Love this mascara! Not clumpy, smells SO good...and the purple is so dark that it's very subtle so it's a great every day product! I really enjoy this mascara. It works great to coat my lashes and smells great too. I love most how it's a natural product.